Bathroom mirrors are a necessity, but you shouldn’t think of them as purely utilitarian; they are a great opportunity to add more style to your bathroom’s interior design. Mirrors are a quick way to refresh your design and are much less expensive than altering fixed finishes like tile and stone, or replacing fixed elements like built-in vanities, tubs, etc. Stylish bathroom mirrors are also a perfect way to bring some designer polish to a bathroom in a rental. 1. Frameless mirrors are a great option when you have busy wallpaper or a textured wall surface as they don’t detract from these design elements. A clean-lined frameless mirror with a beveled edge works perfectly in this design situation. 2. A mirror with a unique shape brings both style and personality to a bathroom’s design, like a mirror in the classic quatrefoil shape. 3. Another style option is to bring in a mirror with a frame that complements your bathroom’s design. A mirror like this one with a beveled mirror and a frame made of end-cut wood would look perfect in a rustic setting. 4. A more ornate style would look great layered over an existing mirrored wall. Layering design elements is essential in interior design to create visual interest in your design, and there’s no reason you shouldn’t use this technique in the bathroom as well. 5. Scale is key when selecting a bathroom mirror. Tall and narrow mirrors are the perfect solution for small bathrooms as the narrow width is scaled just right for small sink or vanity areas. The height will give the room more verticality and make it seem like you have higher ceilings. Conversely, if you have particularly high ceilings or a wide expanse to cover, look for eye-catching large bathroom mirrors. When selecting a mirror, make sure that it is not wider than the sink or vanity you plan to hang it above. 6. Bathrooms are full of hard edges that could use some softening, and round mirrors will add the perfect amount of softness to your design. 7. 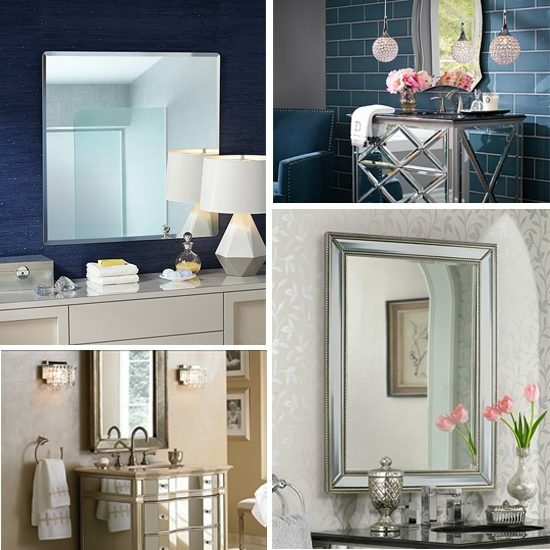 Hang a pair of mirrors over side-by-side pedestal sinks or above a double vanity in place of one large mirror. 8. A mirror with an intricate frame will dress up a simple bathroom or make a dramatic impact in a space like a powder room. A powder room is the perfect space to have a little design fun and a mirror with an intricate frame in front of a boldly wallpapered wall makes for a fun and dramatic space. 9. Lighting, like in any room, is essential in a bathroom. You want your face to be evenly lit when applying makeup or doing any other grooming task. Who wants to look in a mirror and have unflattering shadows cast on their face that makes your face look ghoulish? Not me. Mirrors with built-in lights are ideal for bathrooms where you might not have room for sconces on either side of a mirror. Once you’ve settled on a mirror style it’s time to hang it. How high you should hang your mirror should be based on your height, or more generally, the height of an average person (5 foot 6 inches is a good average height to work off of.) The mirror needs to be hung so the person looking into the mirror’s eyeline falls around the center of the glass. Make sure the base of the mirror is at least 6 inches above the counter top or sink. These styles of bathroom mirrors are a small investment that can make a big design impact. Which style would work best in your bathroom? Has this post helped you make a decision on that front? Let me know in a comment below!